China strictly controls any graffiti that signals dissent even while promoting innocuous graffiti. 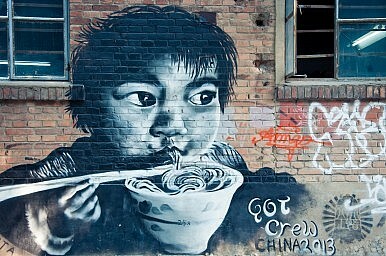 This is part two of a two-part series on graffiti in China. You can view part one here. To recap — a child was arrested and almost removed from her father’s care for drawing flowers in chalk. The fact that this punishment caught her and her family “by surprise” indicates that they at least have a sense of proportionate justice. This case reveals that the great license enjoyed by graffiti writers in China is more mirage than freedom. Just as Hongkongers may “freely” choose pre-approved political candidates, writers may “freely” express pre-approved opinions. What’s truly frightening is that this is what it looks like when the government goes easy. However certain forms of polemical graffiti are tolerated. In Nationalism, Language, and Muslim Exceptionalism, Tristan James Mabry describes the experience of Dolkun Isa, currently secretary of the World Uyghur Congress. In 1988 he organized protests at the University of Xinjiang, where he was a physics major, to express outrage over campus graffiti calling for the enslavement of Uyghur men and the forced prostitution of Uyghur women. The school was outraged too and took immediate action — Isa was expelled. The government is particularly sensitive to voices of dissent in Hong Kong, Tibet, Xinjiang, and other centers of separatism, which are considered one of the “three evil forces” (along with terrorism and religious extremism). Consequently, these voices are prosecuted or terrorized as they are considered a national security threat, i.e. a threat to Party hegemony. Meanwhile, apolitical graffiti is promoted in these regions. In August 2014 China Daily reported on an international graffiti contest held in Karamay, Xinjiang and this month People’s Daily reported on “catchy campus graffiti in Inner Mongolia” that included images of Doraemon and Garfield. Perhaps it’s fitting then that graffiti is known in Chinese as tuya, a term also used to refer to children’s drawings — that is, cute works of no real significance. Since outlawing graffiti wouldn’t actually end graffiti, the government gets out in front of the movement by selectively supporting it while damming any unwelcome currents of thought. In “Public Surfaces Beyond the Great Wall: Communication and Graffiti Culture in China,” Caitlin Bruce discusses “the way art can be marshaled into the service of affirming […] a particular narrative of nationhood.” China even sponsors graffiti contests, co-opting art to promote its own message. In one such contest, Bruce writes, the graffiti crew ABS, which covered a wall of the Beijing Institute of Technology in June 2009 with a piece addressing the 2008 Sichuan earthquake, in which 5,335 students died. Government corruption had led to the construction of “tofu schools,” poorly-built schoolhouses that crumbled during the quake, and mourning parents were “treated like criminals for trying to bring those responsible to book.” ABS’s piece was ironically named Duo Nan Xing Bang, a chengyu that means “Much Difficulty Excites a Nation,” or in Western terms, “what doesn’t kill you makes you stronger.” But Premier Wen Jiabao praised the work, eliminating any underlying message of dissent. All this raises an important question. Who says graffiti has to be political? In 2003 film critic A.O. Scott described his experience riding the D train from Brooklyn to Manhattan, witnessing a child ask his mother, “what’s graffiti?” The mother, Scott says, gave a sensible reply “emphasizing the dangerous, rule-breaking nature of the act.” The child then innocently remarked, “I think it’s beautiful,” and in so doing “resuscitated an ancient civic and aesthetic controversy […] between the civic impact of graffiti and its artistic status.” To an extent, graffiti’s mere existence is a political act that engages this controversy, and whether it asserts any answers, it raises the question. Is China's meritocracy actually a better alternative to Western-style democracy?